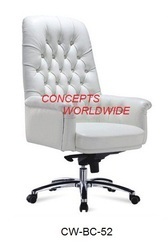 Designer Office Chair online with Price, Manufacturers, Suppliers, Traders and Companies in India. We offer 'Slimline' Office Chair from Inspace India. For our esteemed clients, we have come up with a premium collection of Designer Office Chairs. Keeping in mind the variegated demands of our clients in India, we have been engaged in offering leather office chairs, designer office chairs and steel office chairs.We are looking for Delhi/NCR query's. Being an eminent organization in the industry, we are involved in providing a premium quality range of Executive Office Chair.